Ford Ranger Wildtrak Accessories recently fitted to a DV8 Works Ranger. 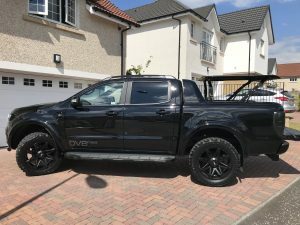 This Top Up Cover was specially ordered in Black to match the DV8 paintwork to the Ford OEM Sports Bars and conversion. The vehicle operates from the Lenzie area of Glasgow. For the ultimate in Ranger styling……. Please click here to view our full range of Ford Ranger Accessories.